Singer Charli XCX picked up a couple of Grammy nominations this year, for both Record of the Year and Best Pop Duo/Group Performance. However, Charli’s red carpet look wasn’t quite as successful as Iggy Azalea collab ‘Fancy’. 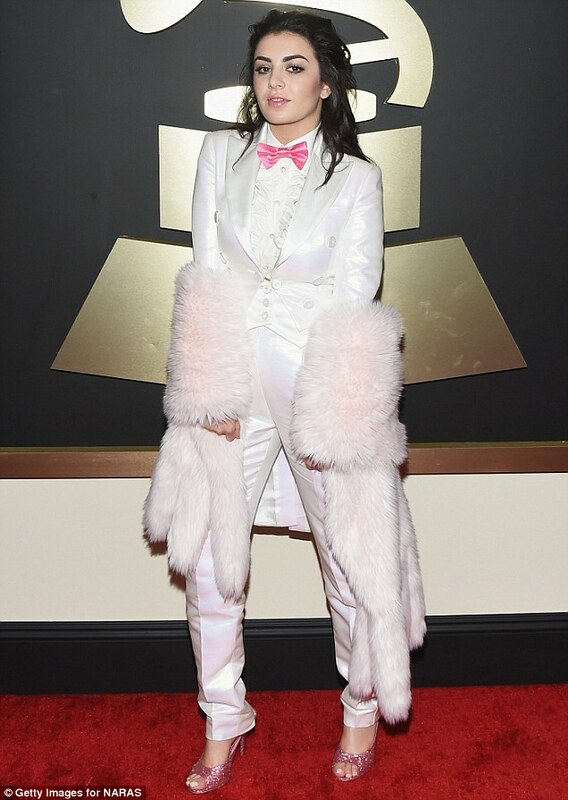 Charli wore a white silk suit with a hot pink bowtie, teaming the outfit with a fluffy faux-fur stole. It was a brave look, but ultimately the tailored suit didn’t work – the singer looked more stage magician than red carpet songstress. It’s not often that soul/R&B singer Janelle Monae looks anything other than fantastic, so it was a bit of a shock when the singer turned up at the Brit Awards in a rather outlandish outfit indeed. Janelle had been nominated for the International Female Solo Artist award, and strode the red carpet in an Emporio Armani suit with a crosshatch pattern. Matched with a black, wide-brimmed hat and frilly white shirt, Janelle’s daring outfit choice left her looking like the baddy in a Western. With her recent Grammy appearance, actress AnnaKendrick showed us that a plunging neckline worn without a shirt – while brave – can look fantastic. However, Jennifer Aniston’s Critics’ Choice appearance showed the risks involved with such an outfit. While Jen still looks incredible (pact with the devil or what? ), her red Gucci tuxedo was just too deeply cut, and what’s worse, it gaped a little around the bust. Jen must have been dreading a wardrobe malfunction all evening, while the cut of her trousers was a little ‘80s power dressing for our liking. Birdman star Andrea Riseborough had a fantastic 2015. While she missed out on an Oscar nomination for her role in the critically acclaimed Birdman, the film itself came away with the Best Picture gong and helped to catapult Andrea into the public spotlight. Unfortunately, Andrea’s red carpet outfit wasn’t quite so successful. The actress wore a tie-dye blazer with an orange shirt, polished black shoes and a piano key necktie. Teamed with her straight fringe, the outfit screamed ‘wacky substitute teacher’. Despite these five unfortunate fashion faux pas, the tailored suit is a fantastic look for women and a must-have for every wardrobe. Take inspiration from the likes of Emma Stone, Lorde and Meryll Streep and arrangeafittingappointment with Hemingway Tailors today. Get creative with our range of tailored garments.